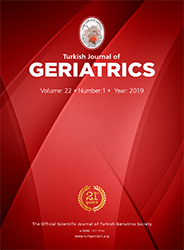 1Health Sciences University, Şişli Hamidiye Etfal Education and Research Hospital, Department of Orthopaedics and Traumatology İstanbul/Turkey DOI : 10.31086/tjgeri.2019150576 Introduction: Septic arthritis of the knee is a serious disease usually caused by bacterial infection. Although this disease is not age-restricted, many cases involve elderly people and young children. The present study evaluated the clinical and laboratory findings of patients aged ≥65 years who underwent surgery for diagnosed septic arthritis of the knee. Materials and Method: We retrospectively reviewed all patients" preoperative demographic data and comorbidities, as well as preoperative and postoperative clinical and laboratory findings. All patients were followed postoperatively at the 3rd and 6th weeks and 6th month and until a mean final follow-up of 36.0±21.6 (12?95) months. Results: This retrospective clinical study included 56 patients (34 men, 22 women) who underwent surgery during 2010?2017. The mean age and body mass index (kg/m²) were 77.3 and 27.6, respectively. In 43 patients (76.8%), at least one infectious agent could be isolated from joint debridement material. The most commonly isolated bacterium was Staphylococcus aureus (28 patients, 50%). Between all follow-up time points, we observed statistically significant decreases in C-reactive protein levels and erythrocyte sedimentation rates (both p<0.001), well as significant increases in SF-36 scores (p<0.001). Furthermore, visual analog scale scores decreased significantly between all follow-up time points (p<0.001) except between the 6th postoperative month and final follow-up (p=0.021).